Update: Despite bipartisan efforts to reform the EB-5 visa program, Congress has reauthorized the program with no changes through September 2016. Through the EB-5 visa program, wealthy foreigners can invest $500,000 to $1 million in development projects and in turn, receive green cards for themselves and family members if the investment can be shown to create 10 U.S. jobs. The program is now up for Congressional reauthorization. That’s what Stephen Yale-Loehr, an adjunct immigration law professor at Cornell University and founding director of the EB-5 trade group Invest in the USA, told PBS NewsHour last week. That’s pretty much what Sen. Patrick Leahy (D-Vt.), eager to attract investment to his state, claimed in a statement. But claiming that EB-5 investments create jobs at no expense to the taxpayer is bogus. It’s also why an expected compromise regarding reauthorization of EB-5 falls short, despite improvements to the program. Having covered the EB-5 issue for five years, especially regarding its role in the controversial Atlantic Yards (now known as Pacific Park) real estate project in Brooklyn, I think the program should be stopped in its tracks and fully revamped, not simply tweaked. The ability to monetize a scarce public asset — access to the United States — has become a gravy train for developers seeking cheap loans, immigration attorneys, China-based migration agencies and federally-authorized investment packagers known as regional centers. The profits at stake prompt deceptive practices — both in marketing investments and claiming job creation — that distort the intent if not the letter of the law. Regional centers — operations that pool EB-5 money for development projects — earn hefty fees from investors, as high as $50,000 per investment. Regional centers also profit from the spread between the interest they pay immigrant investors and then charge entrepreneurs. The green card alchemizes profits. Think about it: As long they get green cards, the immigrant investors don’t really care about interest and will take a 1 percent return. Meanwhile, the entrepreneurs getting the loan are eager to pay the regional center 5 to 8 percent as opposed to 12 percent they might have to pay on the open market. No wonder the number of regional centers has leaped. Check out the graph below from a 2014 Brookings-Rockefeller report, reporting on 2013 figures. 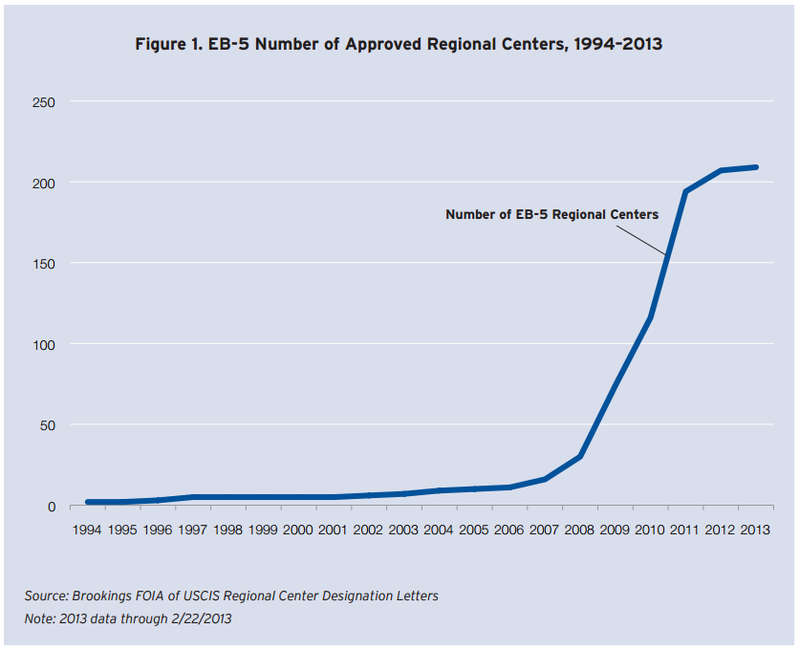 It looks dramatic, but the number of regional centers as of early 2013 has since more than tripled to 781 today. The current legislation may curb some of the worst abuses, but it essentially represents an effort to expand access to the gravy train, rather than stop the train and rethink the program. University of Chicago Law professor Eric Posner calls the price “extraordinarily low.” No wonder the annual quota of 10,000 is oversubscribed. Most investors are Chinese nationals, seeking to get their children educated in the United States. But allowing the rich to buy access is not unusual. It’s the way we do it. Many other countries, including Australia and the United Kingdom, offer investor visa programs. But the U.S. has a relatively low minimum investment in comparison and a Rube Goldberg-type program, in which private entities market public assets. Other countries retain more public oversight. Under the compromise legislation, the minimum investment would rise to $800,000, which is still rather low, and the federal government would have more tools to curb fraud and abuse, of which there have been a number of egregious cases. However, as the saying goes, the scandal is not what’s illegal, it’s what’s legal. First, EB-5 funding doesn’t necessarily “create jobs.” It might if it’s seed money for projects that otherwise wouldn’t have launched in rural areas or areas of high unemployment. But many investments aren’t that. The Government Accountability Office this year concluded that the agency overseeing EB-5, the U.S. Citizenship and Immigration Services, could not validly analyze job creation. After all, projects financed through regional centers don’t require a headcount of employees. An economist’s report, which calculates not only direct jobs, but also indirect and induced jobs caused by spending, can suffice. Let’s say that you invest in an apartment construction project: The direct employees are construction workers, while indirect jobs are those workers at factories making the steel. The workers at the deli where the direct and indirect workers get their morning breakfast are induced jobs. That all can get a bit fuzzy. Indeed, with Atlantic Yards, evidence suggests that a portion of the first round of $228 million in EB-5 financing was used to replace a high-interest land loan. Meanwhile, potential immigrant investors, wooed at flashy investment seminars featuring retired basketball stars like Darryl “Chocolate Thunder” Dawkins, were told they were putting money into the Barclays Center arena — which was already funded. No cost to taxpayers — really? Second, if EB-5 represents no direct cost to taxpayers, that ignores “opportunity cost” — that is, the benefits the public could get from an alternative policy. One of the oddities about the EB-5 program is that the U.S. government is giving out the green cards, but the entrepreneur who puts together the investment gets the money. This scheme seems inefficient and open to corruption. If our government really believes that it is a good idea to sell green cards, maybe we should drop the pretense that this is a job creation program. It might be more efficient to have the money go directly to the U.S. Treasury and reduce the deficit by billions of dollars a year. In fact, the U.S. government could auction off these green cards and perhaps raise even more money. The debate in Washington significantly concerns targeted employment areas, which are defined as rural areas or areas with high unemployment. While the standard EB-5 investment is $1 million, investment in targeted employment areas lowers the threshold to $500,000. The blue shaded area constitutes the project site. 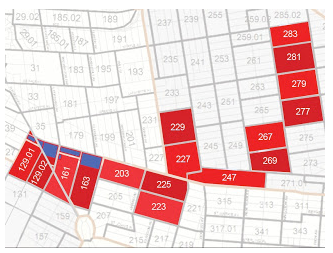 The red constitutes the census tracts that were used to calculate the targeted employment area. Map by Abby Weissman for Atlantic Yards/Pacific Park Report. No wonder the vast majority of EB-5 investments occur in targeted employment areas. Four years ago, I reported on what I dubbed “the Bed-Stuy boomerang,” a targeted employment area devised for the EB-5 investment, which included the prosperous area around the Atlantic Yards site and a poorer district. 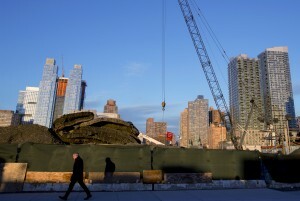 The New York Times pointed to similar distortions, in which a targeted employment area including the Battery Maritime Building in prosperous Lower Manhattan leaped across the East River to connect to an impoverished zone around a housing project. As the Wall Street Journal explained, most current EB-5 beneficiaries accept the Grassley-Leahy compromise, which would limit gerrymandering and thus help projects in the Senators’ rural states, but the developer behind Hudson Yards wants to keep the status quo. The recent revision is somewhat less restrictive. In a modest reform, the new legislation mandates that one of the 10 required jobs be a direct job, validated with a head count. The major EB-5 trade group, Invest In the USA, initially resisted that, but apparently now accepts it. But Invest In the USA pushed back on another proposed reform that would limit immigrant investors from getting credit for more than 30 percent of the jobs created by funds from other investors. They got their wish. So the EB-5 industry will still benefit from rules that allow them to credit immigrant investors for jobs created by the entire pot of money. With Atlantic Yards, for example, the number of jobs generated by the first round of EB-5 funding, $228 million, were calculated based not on that sum but on a purported $1.4 billion “project,” including the already-funded Barclays Center arena. In other words, the immigrant investors got credit for jobs financed by public subsidies and government-authorized tax-free bonds, funding that was already in place, not leveraged by the EB-5 investment. If that sounds strange, the EB-5 gold rush gets even more bizarre. The two most recent rounds of EB-5 funding for Atlantic Yards, since renamed Pacific Park Brooklyn, were launched on behalf not just of initial developer Forest City Ratner, but its new 70 percent partner in a joint venture, the Greenland Group. Shouldn’t that be enough to rethink EB-5? 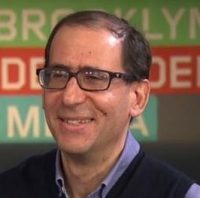 Brooklyn journalist Norman Oder writes the watchdog blog Atlantic Yards/Pacific Park Report and is working on a book about the project.